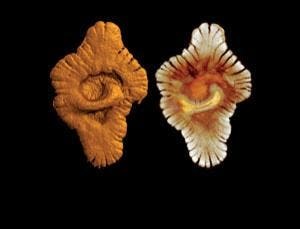 At 2.1 billion years old, a new fossil could be the earliest known multicellular life form.The earliest life to display multicellularity is a hotly debated subject, mainly because of questions of definition. Until now, the 1.9 billion year old Grypania fossils, found in Michigan, were widely seen as the first clusters of organized and communicating cells. But new fossils (pictured left), from Gabon, West Africa, may take the prize. The 250 or so irregular blobs, up to 12 centimeters in length, have scalloped edges, suggesting an organized and growing colony of coordinated cells. "Single cells don't normally grow to that size," says Stefan Bengtson from the Swedish Museum of Natural History in Stockholm. Their larger size made the organisms more stable, and better able to weather the violence of storms. While other soft-bodied creatures of that age have long since vanished, these organisms were preserved because their body parts were replaced by pyrite, and the sediment around them wasn't buried or cooked. It is thought likely they emerged at this time to take advantage of a rise in atmospheric oxygen, which began around 200 million years earlier. Casey Kazan via Nature (DOI: 10.1038/nature09166).